15 new showrooms in FY 2012- 13 with a total investment of Rs. 1300 Crores. 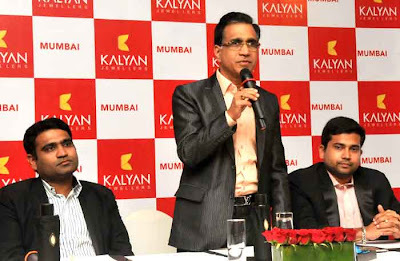 Kalyan Jewellers, India’s leading jewellery retail chain is all set to open three showrooms in Mumbai. All three showrooms will open on 24th March 2013 .The showrooms are located in Vashi, Thane, and Borivali and will be inaugurated by Kalyan Brand Ambassador Aishwarya Rai. Kalyan Jewellers has a predominant position in south India and had embarked to create a national footprint in the beginning of 2012. The company today has retail store strength of 45 showrooms across the 4 southern states and Gujarat. In the financial year 2012- 13, the company opened 15 new showrooms with a total investment of Rs. 1000 crores. They plan to increase this by adding 20 showrooms in India and internationally in FY 2013-14 with an investment of Rs 1300 crores. Speaking on the occasion T.S. Kalyanaraman, Chairman, Kalyan Jewellers said “We feel privileged to serve the people of the great metropolis of Mumbai. We are on track with our plans to be a national player and Mumbai is a major milestone in that journey”. Mr. T.S. Kalyanaraman has made it to this year’s Forbes List of Billionaires, and is ranked 52 in India and 1342 globally. The company is the single largest self owned jewellery retail chain in the country in terms of number of showroom, and turn over with the single maximum bullion purchase from SBI in jewellery retail crossing 5 tons. The company has ambitious plans to open 80 more showrooms in the next three years. These are being planned in almost all Tier 1 & 2 cites, Middle East, GCC Countries, Singapore, Malaysia and Sri Lanka. The projected turnover for 2013 – 2014: Rs. 13,000 crores. Mr. Amitabh Bachchan and Mrs. Aishwaraya Rai Bachchan represent Kalyan Jewellers nationally. To represent the company regionally they have stalwarts like Nagarjuna in Andhra Pradesh, Sivaraj Kumar in Karnataka, Prabhu in Tamil Nadu and Dileep in Kerala. Kalyan has been at the forefront of pioneering efforts to educate the public of cheating and malpractices in gold quality and pricing through their campaign ‘Fight against Impure Gold”. Kalyan Jewellers is the flagship of the prestigious 100-year old Kalyan Group with its origins in textile manufacturing and retailing. The group’s forayed into jewellery retailing two decades ago in 1993, and has retail store strength of 45 showrooms across the 4 southern states and Gujarat. Kalyan Jewellers is a clear market leader in most of the markets it operates. Kalyan Jewellers is in the midst of a major expansion spree and is poised to enter Gujarat and Maharashtra in 2013. The company has set an ambitious target of 100 showrooms by 2015.